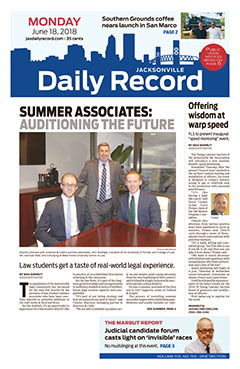 The Jacksonville Daily Record and Jacksonville Record & Observer are unlike any other business information medium in Northeast Florida. Its content is geared specifically for Northeast Florida’s business leaders. With comprehensive, authoritative coverage of Duval and St. Johns counties, the Jacksonville Daily Record and Jacksonville Record & Observer. 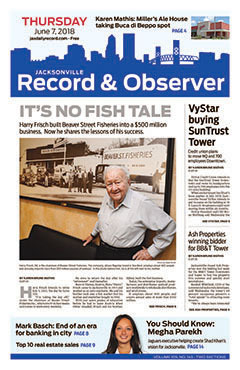 It strives to be first with breaking Jacksonville business news and is regarded by readers as the region's most accurate and reliable source for news and information on Jacksonville development; industry and economic trends; law and the courts; companies and CEOs; and City Hall news affecting business. Columnist Mark Basch tracks the growth and changes at the region’s public companies. Staff Writer David Cawton uncovers how government impacts business. Editor Karen Brune Mathis is always first to report new projects changing Jacksonville’s economy and landscape. Research Director Scott Sailer shows in snapshot graphs the economic data business leaders need to know. Profiles of business leaders making a difference at work and in the community. The biggest real estate transactions over the past week in Duval County. Key upcoming events you won’t want to miss. Top-level promotions and new hires at the region’s companies. Flip through an issue of the Daily Record.